What a beautiful day to celebrate Deanna and Roberto’s amazing wedding ceremony at Rooftop 220 in trendy Downtown Tampa near Armature Works. Pastor Brian Jones with Sensational Ceremonies worked alongside the couple to create the perfect custom ceremony. 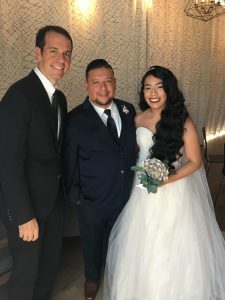 The team at Rooftop 220 led by Olivia, did a fantastic job and provided a first class experience for the bride and groom, vendors, and guests for this intimate gathering. Rooftop 220 offers spectacular city and water views along with a nice breeze to keep us cool. Cindy with Breezin’ Entertainment did not miss a beat during the entire planning process. Stacy Washburn Photography was also a pleasure to work with, maneuvering around the ceremony to capture many fantastic moments for the couple. One of my favorite moments was hearing the couple recite their own personal vows to create a touching exchange that they will remember forever. The couple even had an “Adventure Book” in the foyer for guests to view full of wonderful fun photos of them. They will be honeymooning at the exciting Walt Disney World in Orlando, Florida and their Disney themed reception showcased their love of the mouse.